Discussion in 'iPhone Accessories' started by jonathanlam, Sep 11, 2014. I second he Spigen Air Skin case. I just ordered one too. With the .4mm thickness the iPhone 6 will STILL be thinner than the 5s with no case. You can't beat that. I just wish it didn't have the raised lip in the front to protect the screen. I'd rather have no obstructions at the edge of my screen. Oh well. I really like this, too. But apparently there's no 6 Plus version? I don't like how the spigen one barely protects the bottom/top/front of phone. I like the option of being able to lay my phone on its face with no worries. It looks like there are some that actually protect the top and bottom, but not every color. I ordered the Luvvitt clear case, its .6mm but has full coverage. If I do not like it, I will try something from Incipio or Maybe even that air skin posted above. I want a thin case but not so thin the camera still sticks out. 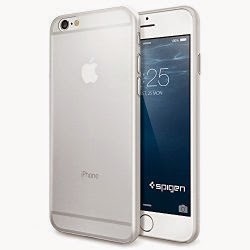 The Spigen iPhone 6 Case is by far the thinnest case for iPhone 6 only 0.4mm and its lightweight and ultimate slim, already ordered mine for iPhone 6. What the OP posted is .1mm thinner. I was going to go with the Spigen but now I'm rethinking it with the Shumuri. Yeah, I'm going to wait till more pictures get posted. But this is probably the case I'm going with. Plus the Spigen doesn't cover the bottom of the device. And looking at my current iPhone 5 bumper, that's where it is scratched the most. The one OP posted is tough! Waiting on more pics. I know Pinlo's Slice 3 is supposed to be really thin, but I've never seen it in person. Only for 4.7" though and even that looks sold out. I went ahead and took a chance with Shumuri. I like the Spigen case but don't like that they leave the top exposed. I'm ok with the bottom being exposed. I'm wondering if the Shumuri case is also exposed at the top. It looks to be thinner than the Spigen but their website does not specify that it is exposed at the top. I'm looking for a thin hard case. Something similar to elago glide case. Minimal design but a hard plastic from drops. Not a big fan of bulky cases. Any suggestions? I took the change and bought a Grey Shumuri case. 15-18 days shipping without tracking for $5 or pay $20 shipping to get it sooner with tracking. Ordered the Spigen 6 case off Amazon. Got the rubberized slim version. That Shumuri looks sweet, the clear case on my gold phone would look awesome. I know there will be hardly any protection but I don't care this phone is big with the bezels and all don't want even more bulk. I'll sacrifice...wondering if I should wait for some reviews though. Can you guys post some pics when you get it? My Spigen Air Skin ($16) arrived today and it's exactly what I wanted. It's an extremely slim case just like the Caudabe Veil ($15) case I had for my iPhone 5s. If you're looking for a slim case, this is the one to get (at least for now). It looks like the iPhone 6 with this case will be thinner than a naked iPhone 5s. Is anyone else waiting for the tech 21 mesh? Smooth and slim... I have it for my 5 and will not buy any other case. Tech21 is not available yet but their blog confirmed it is coming. Does that protect the front or bottom any? I have a Moshi case on my 5 but they don't seem to have one yet for the 6. Pulled the trigger on the Shumuri. Had a Caudabe Veil on my iPhone 5 and loved it. Hoping this is somewhat the same. If not, I'll give the Spigen Air Skin a shot. Looks exactly like the Caudabe Veil. Im holding out for the Caudabe if for no other reason than they have a good warranty and you'll probably need it for a case like this. Nicest case design I've seen yet. Available in the UK? I understand wanting thin but I had the Veil for 5s, almost no protection and I rather have some so balk at thinnest going forward.